I’ve moved several times in the last two years. What a pain. Particularly as I’m a media hoarder. Boxes of vinyl (albums and 45s). Boxes of CDs. Boxes of DVDs and BluRays. I finally had to concede, my daughter was correct. It was time to digitize. So, 2014 became the year of ripping the audio collection. 2015 is slated as the year that I digitize all of my old Hi8 analogue tapes. I had some hardware lying about from reviews that I did years ago. But as technology has progressed at the speed of dog years over the interim, I figured it was time for some new kit. And the first name that came to mind for transferring consumer video was Elgato. Hours upon hours of work lie before me but it doesn’t send chills down my spine so long as I know that I’ll be using quality equipment. And Elgato’s Video Capture makes this task amazingly simple. Connecting the system to your computer can practically be done blindfolded. You were probably more intimidated the first time you plugged your VHS deck into your TV (if you’re that old). Your Elgato Video Capture hardware arrives in a box (remember those?). Inside you will find the video capture device (with composite inputs and an S-Video pass through), a composite video/RCA stereo cable and a Composite-to SCART adapter. I have to say that I was disappointed that a S-Video cable was not included as part of the package That required a run to the store, something that I was hoping to avoid by having the Video Capture delivered to begin with. You are offered a choice of two video resolutions: 640×480 (4:3) or 640×360 (16:9). You also have two choices for formatting: H.264 at 1.4 MBit/sec or MPEG-4 at 2.4 MBit/sec. 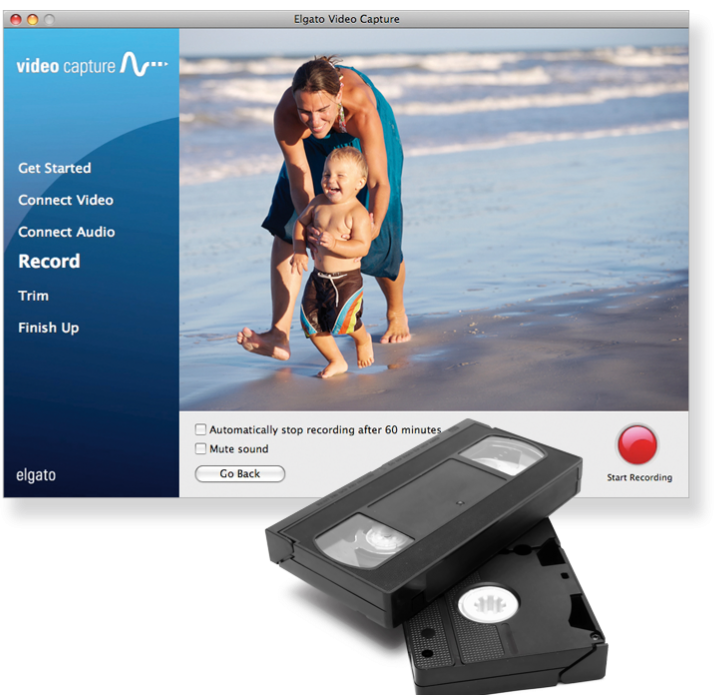 Video Capture will automatically detect NTSC, SECAM, PAL and PAL/60 video formats for worldwide compatibility. Your audio is rendered at AAC, 48kHZ, 128 kBit/sec. You download the software for your Video Capture from their site. You will also find knowledge-base articles and support FAQs, plus you can download the manual. 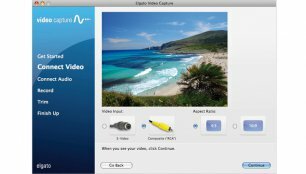 The software assistant not only guides you through every step of hooking up your hardware but even offers a basic tool to trim the beginning and end of the captured video. The assistant will help you add your video to iTunes, upload your video directly to YouTube, edit it right away in iMovie ‘09 or higher, among other options. You can sync your generated files with video capable iPads, iPods, iPhones and Apple TV. But the files in MPEG-4 (using my S-video cable), the results were very impressive. I was more than pleasantly surprised particularly when you consider that these tapes were from 10-24 years old(place ‘Deep Sigh of Relief’ here). 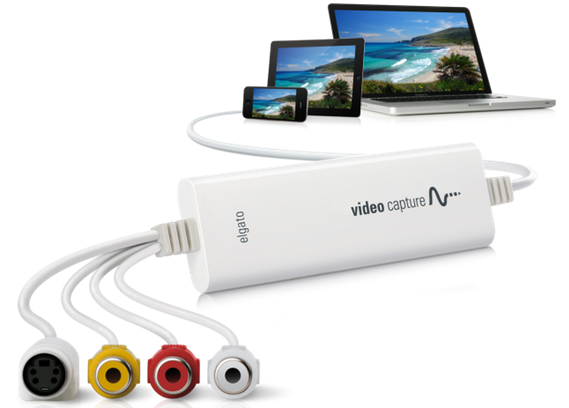 I would definitely recommend that you spend the money to obtain an Elgato Video Capture to digitize your memories. As to whether or not you wish to spend the time is your choice. This entry was posted on Monday, May 4th, 2015 at 5:42 pm	and tagged with Apple, Apple software, Frank Petrie, hardware, Mac software, Review, reviews, video software, YMP, YMPNow and posted in Reviews. You can follow any responses to this entry through the RSS 2.0 feed.